Thanks. I contacted them and updated to 2.2 successfully. Wonder what happened to 2.3? Is there any user detectable difference between 1.8 and 2.2? mkpl said earlier that over sharpening is still there at 2.2. So, what has changed? I signed up just to also register my dissatisfaction with image quality. I've been a happy C1 owner for some time, but wanted to upgrade to the Pro for both the GPS and the improved image quality. What a step backward. Someone here used the phrase over-sharpened mess and that description is right on target, even after applying a firmware update yesterday. I'm pretty close to boxing it back up and requesting a refund. Strange. I got version 2.4 now, with basically same "changle log" as pauldeys screenshot above. "1. Better image quality 2. Bug fix"
I'll update my camera tomorrow morning and if i got enough time, i'll check what the picture looks like this time. 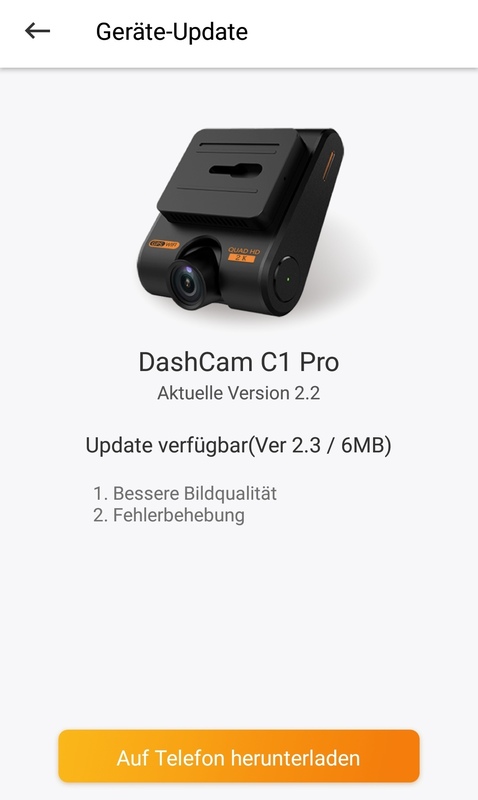 And now i got answer to one of my earlier questions, i just started roav-app far away from my camera and update notifier was first thing i saw. It is much more natural with 2.4. Did not touch the camera at all, screenshots are from videos stamped ~2 minutes apart, only fw update between them. GIF is quite bad format for this, beside the ability to animate. That gradient on the sky is not visible on the original video, but that is not the point of this demonstration.